Developing a new ecommerce web-site ? then a must read .. | TransPacific Software Pvt. Ltd.
Home » Blogs » TPS2015's blog » Developing a new ecommerce web-site ? then a must read .. Developing a new ecommerce web-site ? then a must read .. Most of the first time ecommerce starters have their priorities skewed. At least that’s what our experience is. Invariably they will start researching open source shopping carts and going through hundreds of spin-off article on Prestashop v/s Magento v/s Opencart…. Or which shopping cart is the most SEO friendly. This is like putting cart before the horse. Want to start a ecommerce venture. Get your data and photographs organized. The biggest problem we have identified with dozens of ecommerce ventures we work with is: unavailability of data and good quality photographs. First get your product info ready in a spreadsheet format like Excel. There are two ways to add new content in any ecommerce site. Either you do your content compilation in a spreadsheet like Excel or Google docs and get it bulk imported in the shopping cart database or do one by one entry from backend from admin section. Most ecommerce vendors prefer to work on spreadsheets and get it bulk imported. All shopping carts like opencart, Prestashop and Magento have open source plugins to import data from csv or spread sheets; provided it is in correct order. Most of the e-commerce carts have a similar category structure at top level. This consist of Category, subcategory description size…. Here is a general template which you can refer to for data organizing. However for different type of merchandise such as electronics or apparel this structure may vary to some extent. 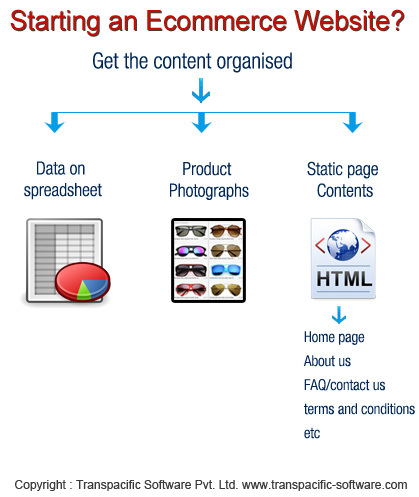 Get your spread sheet data ready with product descriptions, categorization, image names etc. Initially this may be cumbersome but it is a onetime effort. Further updates on data can be directly done though cart admin interface. 1) Atleast 3 photographs of a product is suggested from different angles. 2) Size typically can be 900x900 or similar. 5) Image names should be entered in the spreadsheet for corresponding products. Once you are done with above data organization the third part is getting your text ready for static page. This Include: Home Page introductory text, About us, Contact Us, Terms and conditions, Return Policy etc. Once these three core contents i.e. data, photographs, static page text are ready you may proceed with selecting which shopping you would like to select.